Boil water with salt. Once the water is boiled, add pasta into the boiling water and leave to boil for 10 minutes. Meanwhile, clean and mince the chicken breast. Heat up a sauce pan with olive oil and butter. Then add a little salt and pepper to the minced chicken and sauté. 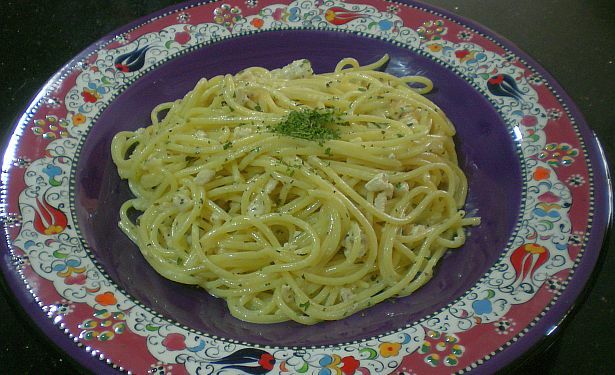 Just before pasta is ready, mix the eggs, cream and parmesan cheese in a bowl. Once the pasta is cooked, drain it and immediately fold into the egg mixture. Do not cool the pasta by washing it with water. The heat from the pasta is sufficient to cook the egg mixture just right. You do not want the egg to curdle. Add basil and parsley to the sautéed chicken and just lightly heat it. Then add the chicken into the bowl with the pasta and toss everything till it is mixed well.